There are several ways that people file, sort and use their coupons. I am going to outline three different options for you. You can mix and match. Make it work for you, not against you. This is the option I use. I like the binders that allow you to slip a cover into the front sleeve. I make my cover pretty and appealing because I honestly think I enjoy using something that’s pretty over something bland and boring. I always put the free page up front. It helps to remind me that I have something free. Put your sections in the order you like. I actually walked through the grocery store I frequent most, and put the sections in order, based on the store layout. 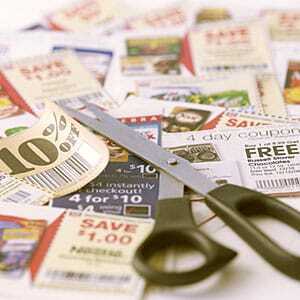 To get started from scratch, check the stores websites that you go to for any printable coupons. You can also go to coupons.com for some awesome coupons. If you don’t already get the paper, I highly recommend signing up for 2 Sunday papers. The extra $1 you spend will be a great investment. If you have family and friends that don’t use coupons, and you feel comfortable doing so, ask if they can set them aside for you. I personally do just fine with my two Sunday papers and my printables. Now that you have a stack of coupons, Start cutting them. Separate them into sections based on your binder. What I like to do is put the ones that will be expiring the soonest, up front. Less coupons are wasted this way. I have a binder pencil pouch in the front of my binder that holds a few pencils, a pair of scissors, and a couple paperclips. I also have a steno pad in the front pocket of my planner that always has my shopping list. I usually do my coupon clipping on Sundays. I jump on the computer, print out everything, cut the coupons out of the paper, and plan my menu partially around what’s on sale that week and my coupons. After the initial set up of the binder, it usually takes about 30-45 minutes once a week to maintain and keep current. For me, saving almost $400 a month on groceries, has made the 2 hours a month worth it. To downsize this option, you can apply the same principles to an accordion file. Some people say that this takes time off of your coupons clipping, but to be honest, I didn’t see it and having this giant stack of coupons that I had to go through every time I added it to my cart, just frustrated me. However…you never know, this may work for you. Everyone is different. A folder, tote bag, or a way to group your coupons together. Ok, now there are a lot of methods for this. I’ll list two. 1. Sit down with your notepad, store ads, and coupons. Write a list of all the coupons and ads you want to use for that grocery trip. Put your pile of “To be used” coupons and ads and bring only those with you. 2. Take your grocery list and unclipped coupons with you to the store, and clip as you need them. I actually used this for awhile…It worked. Follow the same steps as the binder, only in file folder fashion. If using the Manila envelopes, label them as you would with the tabs. In the front of the box make sure you have those scissors, a pad and pencil…and your free stuff section. When shopping with the box, do the same thing that I suggested above. Pull your coupons out as you put your item in your cart, and stick it in the front of the box for an easy check out. Thank you for the information. I am trying to get started coupon shopping hoping to save money on groceries an get some storage ahead for the hard times.